Grocery store payroll software that is easy to use, affordable and gets installed in-house so you have full control over your data. Pay store managers, produce / grocery stockers, cashiers, customer service reps, bakers, clerks and other types of employees. Our software automatically calculates federal and state payroll taxes. Prints checks with stubs and generates employee W2s. Very simply workflow. No per pay charges or per employee fees. Perfect for full-time, part-time, casual or contract workers. Exports payroll data to your accounting software. Download free trial now! For $119 only, process payroll for up to 10 stores with up to 75 employees per store for one calendar year. Do you manage or operate a grocery store? With managers, clerks, and other staff, it can be challenging to administer payroll for a grocery store. The solution is as simple as Payroll Mate®. By implementing this grocery store payroll software, you can rest easy knowing that your payroll will be administered accurately and timely. 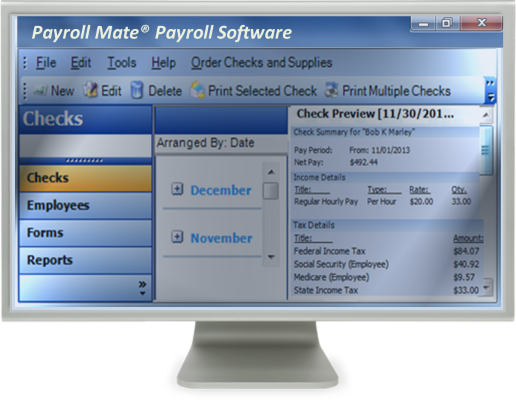 • Getting started with Payroll Mate® is easy. Simply create your company, add your employees, and create payroll checks for your employees. Payroll Mate® offers easy to follow wizards which will walk you through the process in a step-by-step manner. Although the program is quite simple to set up, support is available via telephone, email, and chat if you have further questions. • Payroll Mate® supports the following pay frequencies: daily, weekly, bi-weekly, semi-monthly, and monthly. The program also supports many types of pay types including hourly, bonuses, per piece, and many more. • The program is very customizable since it allows you to create unlimited custom created income, tax, and deduction categories. This way, you can feel confident that your payroll system will be able to handle any type of payroll. • Net pay, Social Security, Medicare, and State and Federal withholdings are automatically calculated. • Payroll Mate® is also designed to help you administer vacation and sick leave time. Choose how such time should be accrued and once everything is set up, your grocery store payroll software will calculate accruals for you. • Whether you prefer to print traditional ready-to-sign paychecks, or you want to set up direct deposit with an additional cost add-on feature, you can do so with ease using Payroll Mate®. • Employee’s pay stubs can be easily printed or emailed so they will always be able to access their payroll figures. • With Payroll Mate®, you can run a variety of different reports to understand more about the amount of payroll your grocery store processes. Some reports that can be generated by Payroll Mate® include Employee Earnings, Deposit Requirement, Tax Liability, Payroll Journal Detail, Taxes and Deductions, and many more. • Once your payroll is complete, Payroll Mate® allows you to export payroll data to a variety of payroll data accounting software applications including Peachtree Sage 50, Intuit QuickBooks, Quicken, and General Ledger. • In administering payroll for your grocery store, you may be concerned with potential loss of your payroll data. This could happen due to a variety of different reasons. Payroll Mate® helps you to avoid this type of issue by automatically reminding you to back up your payroll data. Restoring this data can be done in a few easy steps. • The program also allows you to set a password for login so you can ensure your data is kept safe. • Do you process payroll for 1099 recipients? If so, you can purchase an additional cost add-on feature to Payroll Mate® and gain the ability to process payroll, print reports, and issues 1099-MISC and 1096 forms at the end of the year. Administering payroll for your grocery store can require a significant amount of time, but with Payroll Mate® you can process payroll easier and faster.